Thank you to so many of the supporters that have already given to our Community Cat Adoption Program. We are so close to our goal and are so happy! Even though we've closed intake, we are still overflowing with kittens and are still in fundraising mode. These funds will help our CCAP volunteers and fosters provide for the cats/kittens currently in our care. Please consider donating now to help us reach our goal! Click HERE to visit our fundraising page. Thank you! the next morning. Mom had other plans and delivered five kittens that evening. Unfortunately, all but one kitten, Gigi, died. They were very tiny and were probably premature. Sandy is going to add mom to her back yard colony and CCAP is accepting the kitten to adopt out once she becomes bigger and healthy. This story encompasses all elements of what SAFCC does: trap, rescue, foster and adopt. Please help us to continue to help community cats like Gemma and Gigi by donating to our Community Cat Adoption Program fundraiser HERE. Wednesday August 16 and Friday August 18. Good news! Wednesday capacity has been increased to 30 cats per day! This is a combination of ferals and pets. Please consider supporting our Macy's Charity Challenge by donating just $5 or more for a Macy's saving pass and shop for a cause--our cause! In addition, anybody who donates at least $5 toward a savings pass will have a chance to win a $500 Macy's gift card! Click HERE to donate and your savings pass will be emailed to you, it's that easy! The Charity Challenge begins ends August 9. Use your Macy's Savings Pass at any Macy's or shop online. Happy shopping and thank you for your support! Thank you to the wonderful individuals that donated items from our Amazon Wishlist! Unfortunately we don't get the items delivered with anyone's name so we can't thank you personally, but we want you to know we appreciate your support and will put your donation to good use! Our adoption/foster team operates solely on donations to care for the friendly cats and kittens we rescue from the streets. If you would like to make a donation from our wishlist, click HERE. The Helpline is a perfect job for someone who would like to help our community cats from the comfort of their own home! You return calls from messages left on our helpline voice mail. People who are retired or not working are purrfect for this job! 1. The Helpline provides information and resources for over 300 callers a month. 2. People are educated about TNR and our classes so they can get the help they need. 3. Trap loan requests come through our Helpline. PetSmart donated more pet carriers than San Antonio Pets Alive! had room to store so being the generous partner that SAPA! is--they offered them to local rescue groups for free! Our Adoption Program will put these carriers to good use! Thank you SAPA!, for paying it forward! We need to recruit more Petco cleaners for all four Petco stores. 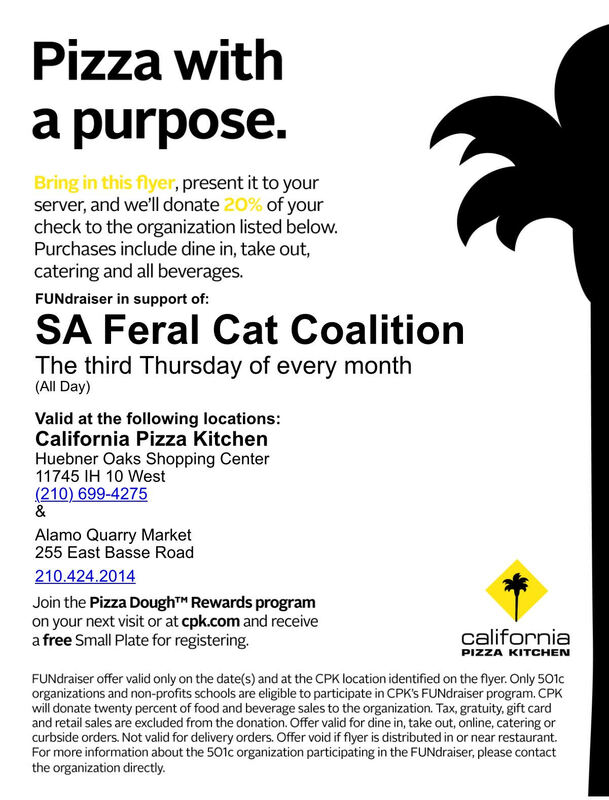 It is more important than ever for us to keep these stores going so we can promote our cats and kittens in foster care. Petco-Fiesta Trails 12651 Vance Jackson Rd. All it takes is two hours a week to make a difference in these cats' lives, providing fresh food and water, cleaning the cubicles and scooping litter. Our Petco volunteers enjoy spending time with the kittens and look forward to their day to clean! Please consider joining our group of Petco volunteers today! Contact Lorraine Cantu at (210) 471-8462 or crazykattlady67@gmail.com for Fiesta Trails & Stone Oak. Contact Hope Soliz for Austin Highway and 410/San Pedro locations at Hsoliz67@gmail.com. Celebrating a Birthday? Having a lunch meeting? Or just need to re-fuel while shopping.... Present this FLYER when you dine in or take-out on August 17 and 20% of your bill will be donated to SAFCC.